Recently, we were in need of emergency excavation on our property. This was due to a water main break. This was a first time experience for us. So the proper precautions were not taken. My question is, "How to remove excess excavation soil from our already established lawn bed". This was a mid winter, wet, icy, and muddy mess. Now I have a 20 square foot area of leftover caked earth aproximately less than 1 to 1/2 inch deep. It is located, adjacent to the 10 foot trench, which is about 3 to 4 inches lower than the lawn area around it. My goal is to return as much soil to the trench as possible. Hopefully I can do this prior to topping the trench off with new soil and re-seeding the trench area. I am in the process of raking the area to remove the caked soil from the now re-emerging grass. Does anyone have any other solutions? Thanks. Sounds like you are doing the right thing, good luck. 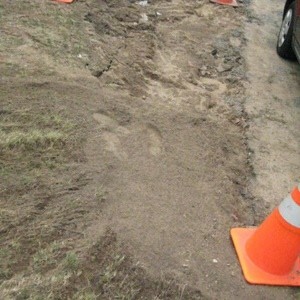 I have the same problem, had a new sewer line put in 10 ft deep and 50 ft long, after paying the contractor the $10,000. they told me they only finish to a rough grade. now I have a 3 ft hole at one end and 3 ft high at the other 50 ft end, in my front yard. Only I can't move this dirt and level it out, I am to old to do it. But who does this kind of work for me, and re plants all new plants and grass they tore out?